I hope it’s really a problem with the methods of detection and not a real scarcity of planets. Kepler will give us soon better planetary statistics, but according to present Harps data 1/3 of solar-type stars have neptunes or superearths with orbital periods of fifty days or less, i.e. a planetary population well within Corot reach if they happen to transit their star. Are there issues with unexpected noise sources or sistematics that are swamping the small guys from the lightcurves? The loss of the detector chain is worrying, especially now that Corot is approaching the end of its nominal mission. Is there a chance to have the mission extended after this accident? We have received information regarding CoRoT, from the mission’s Project Scientist, and BtC collaborator, Malcolm Fridlund. What do you want to read first? The good or the bad news? Maybe we should start from the last to move on to the positive side right afterwards. From the spacEurope ages, there was a presence who marked the difference for the good will with which always replied to every solicitation, including the fact of making himself available to answer a set of questions posed directly by the readers. 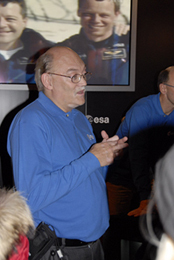 That man was Malcolm Fridlund, ESA COROT Project Scientist.